There was a fireside for four stakes in the valley tonight. I think it was kind of short notice and not very well advertised because we barely filled up the chapel. Anyway, we went to that. We learned some good things, and ate those cinnamon bun things that they like to provide at these stake activities. Afterward, we went back to my place and talked about all the things that seemed pertinent to talk about. Then we parted to our separate ways, and now here I am writing in this log. Emily ate cinnamon buns for dinner. So far, Emily has a track record for eating ice cream and cinnabuns for dinner. Life is short, eat cinnabuns for dinner. We went to a devotional to get all spiritually fed and whatnot. We talked earlier in the week about going dancing afterwards, but we were both pretty tired so we went back to his house to hang out for a bit. I learned neither one of us is a fan of the cold. He impulsively challenged himself to a half marathon and the story is pretty funny. Six. Jake is always great, but he's been especially awesome the last few days. The week started off a little weird. I was starting to shut down a little, but he didn't. He stayed present and brought the good vibes which helped me to pull myself out of my head a little. He's set the tone for the relationship on more than one occasion. It's been a good lesson to me of how positivity can turn things around. For real. Little things add up: He always greets me in a way where I feel welcome and like he's happy to see me. We've had a few good conversations that make me feel more grounded in what we've been trying to build. And he just does lots of weird goofy stuff that makes me laugh. Seriously, if you can make me laugh, that helps me a lot in being present and chilling out. I think if I was with someone who wasn't funny, my soul would crumble like a leaf and die (not to be dramatic or anything haha). Where we'll be a week/month/year from now is TBD... but I feel like the week is ending on a good note. 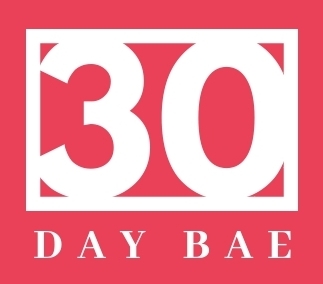 We talked today about how we couldn't believe 30 days is almost up! I feel like Jake has been in my life for a lot longer, but the time has also flown by. You're a strange thing, time. Brian and Sarah. Day 22. Brian and Sarah. Day 21.